Kate and Mannix are struggling to help their son Fergus, who is being bullied at school, and their daughter Izzy, who has taken the role of his protector. Kate decides that a holiday away from their home in Limerick, Ireland, is just what they need. She sets up a house-swap with a family in New York City. Hazel, Oscar and their two kids are also in need of a vacation, and Hazel decides her native Limerick is the place to be. But neither family ends up with the vacation they had planned. 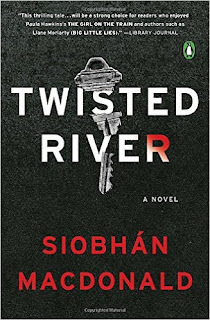 Twisted River by Siobhán MacDonald starts right off with Oscar, hands covered in blood, closing the trunk of a car on a dead woman as his children come up behind him asking where mom is. This is where we start. But then we go back to see how each family ended up where they did, and ultimately how the woman ended up in the trunk of the car. This is but one mystery in this story though. MacDonald includes plenty of twists to live up to the name of the novel. Because of the nature of the storyline, I don't want to say much more about the plot, but I did find both families interesting and enjoyed the author's writing style. It was an easy, engaging read. I will say I found myself more drawn to the second half over the first, because it started to go in a slightly different direction than I had expected. There's plenty of suspense and opportunity to try to figure out what's really going on with both families ~ they're rather complex people! Overall, I enjoyed this mystery about family secrets and the consequences of our actions. 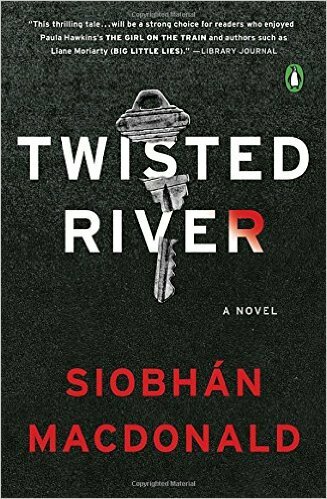 This review was written based on a copy of Twisted River that I received from the publisher in exchange for an honest review. This post includes Amazon Affiliate links. If you purchase something using my link, I will receive a very small commission but your price does not change.